For a small town, Snaith has much to offer walkers and visitors. Snaith and Cowick is an area steeped in history – The Priory Church (Circa 1100AD), the site of a Royal Hunting Lodge where parliament once met, an ancient toll bridge and much more. With the Trans Pennine Trail passing though, Snaith is an ideal place to stop for refreshment or even spend a night or two. Snaith itself has five public houses, three serving food and offering accommodation, three cafes, a fish and chip restaurant, and Indian restaurant and much more. 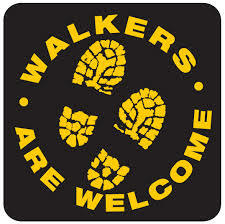 It was ten years ago that Hebden Bridge in West Yorkshire became the first ever Walkers are Welcome (WaW) town. Today, there are over 110 towns and villages in England, Scotland and Wales that have become nationally accredited WaW locations.The WaW National Committee recently conducted a survey to collate the many achievements of current members across the UK in the last 10 years. Together, they have created new walking routes – over 1200 routes covering over 6,400 miles; opened up routes that had been abandoned; launched walking festivals – representing 115 days per year and involving nearly 9,000 people; maintained thousands of miles of paths; promoted the use of public transport; publicised a wide variety of walking opportunities for all ages and abilities; and considerably helped to boost their local economies. 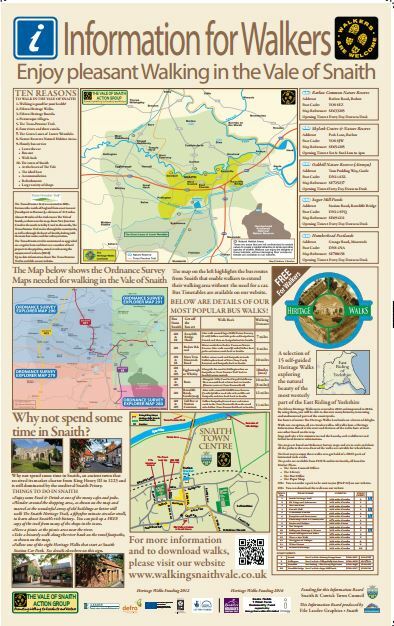 The WaW scheme has meant that SNAITH is now on the UK walking map and has opened the eyes of local people and visitors to the walking opportunities on our doorstep. As volunteers, we have worked on a number of projects over the last two years. We have re- launched HERITAGE WALKS with improved surfaces, signage and updated Walk Packs. We have installed Walker’s Information Boards at The Station Car Park and Council Office Window. We have created a new information Board at The Town Lock Up. We have produced a leaflet about walking in The Vale of Snaith- this leaflet is available in many shops and services around Snaith as well as libraries in Selby, Goole, Howden, Thorne, Hatfield. Pontefract, Sherburn. We have produced a stand- alone leaflet about The Snaith Heritage Trail -this leaflet is available in many shops and services in Snaith. We delivered The Snaith Heritage Trail leaflet to EVERY house in Snaith & Cowick, together with a letter encouraging people to walk the trail and also walk the other 14 Heritage Walks. We have produced a Heritage Walks themed leaflet to encourage walkers to visit Snaith and The Vale. These leaflets are available in libraries and Tourist Information Centres throughout Yorkshire and North Lincolnshire. We recommended the siting of the new bench on The Riverside which is on the route of FOUR Heritage Walks. We organised walks as part of Yorkshire Wolds Walking Festival which brought 20 people to Snaith for the first time in their life. We will continue our work to bring the pleasures and benefits of walking to an ever-wider audience, and to offer a warm welcome to locals and visitors who, in turn, help to sustain our local businesses and facilities. Snaith and Cowick Town Council endeavour to keep all public footpaths well signed and accessible but in the unlikely event of you experiencing a problem please report it to the council using the contact page on this website.